An Ancient Solar System...: Answers for Authors: What's the view like from other parts of our galaxy? 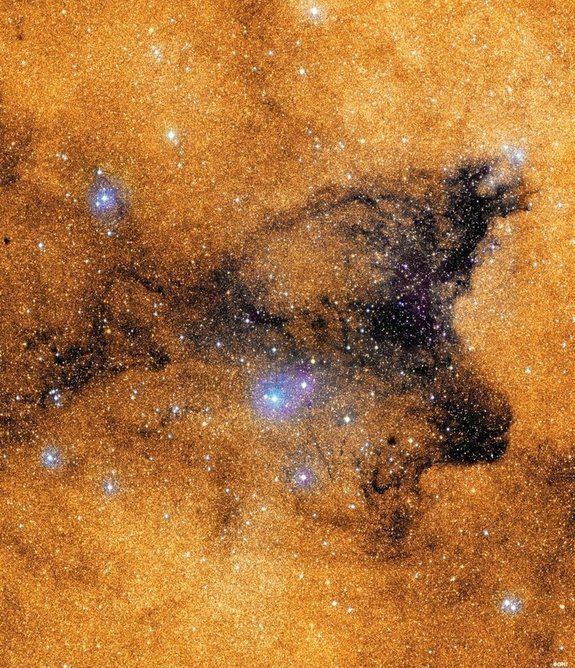 Answers for Authors: What's the view like from other parts of our galaxy? Go out on a really dark, clear, night, far from any artificial lights, give your eyes time to adapt to the darkness, and look up. 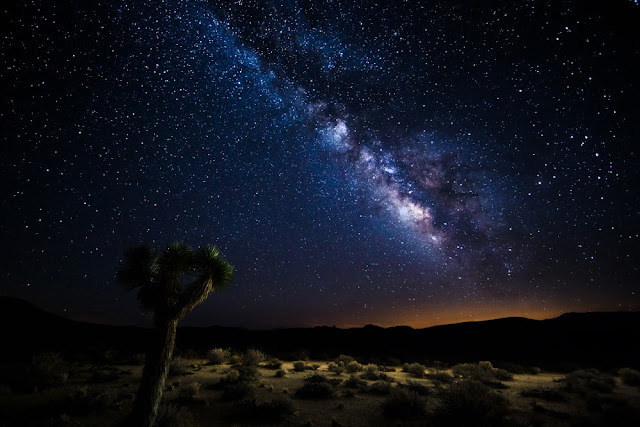 You will probably see many more stars than you’re used to and, stretching across the sky from horizon to horizon, a long band of faintly lowing fuzziness: That's the Milky Way, the galaxy that our Sun, our solar system, and this planet are part of. The central bulge / galactic core: The centre of the swirl, the core is made of a mix of stars of all ages. It's also one of the oldest neighbourhoods, and has both a lot of old stars and clusters of very young stars, and gas clouds primed for new star growth. Everything is very close packed (less than half a light year between stars on average, often much closer). The bulge is about 5,000 light years in radius, and has at least two gigantic black holes in the centre, one of which is the supermassive Sagittarius A* black hole, our galaxy's central black hole which weighs as much as 4,300,000 Suns. The disc/arms: The arms of the swirl. About 60,000 light years in radius, and around 1,000 light years deep where the Sun is, it's mainly made of young to middle age stars. Beyond the edge of the disk is a mysterious ring of stars and gas surrounding it, with a radius of 75,000 to 80,000 light years, called the Monocerous ring. The galactic halo: This is where my coffee metaphor runs out completely, unless you’ve brewed your coffee in weightlessness and then spilled it – these are, well, wispy bits outside the main galaxy. They are made of widely spaced gas and stars, floating above or below the plane of the disk in a rough ball, stretching to a radius of 130,000 lightyears. Although the stars and gas are incredibly sparse there, set within the halo are locales called globular clusters: Round clusters of hundreds of thousands of ancient stars, which are often separated from each by less than the width of our solar system. Let’s assume I’ve got a ship fast enough, and well supplied enough, to go around the galaxy and stop in each section. What would my human eye see? 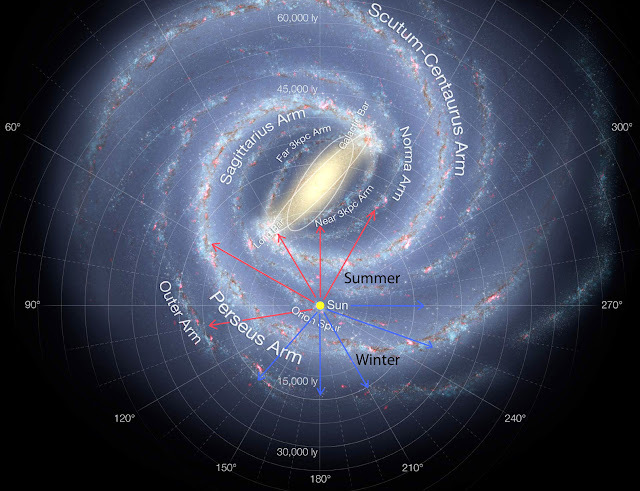 A map of the galactic disk, showing the spiral arms. Courtesy of Universe Today. After my eyes have some time to adjust to the darkness the Milky way is a rough, very broad, band of faintly glowing fuzz stretching across the sky. In the direction of the constellation Sagittarius I can see a bulge in the band, with dark gaps in it - that's the direction of the galactic core. The gaps are dark nebula, blocking light from that direction out. I can't actually see the galactic core - there's too much gas, dust,and intervening stars in the way. What I see is the result of the disk getting slightly thicker in that direction. If I look about with care I see the occasional dim fuzzy blob of a star forming nebula (like the one on Orion’s belt), and glittering collections of blue stars - open clusters. 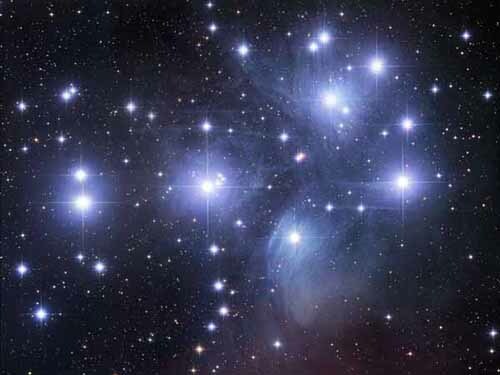 Above: The Pleiades, a cluster of young stars still wearing the remains of the nebula that created them. The stunning colours I've seen in pictures from space telescopes are nowhere to be seen because, well, my eye isn't a space telescope. But it's good enough to make out some things: Above and below the plane of the galaxy I can see the Magellanic Clouds - smaller galaxies that orbit the Milky Way - as broader fuzzy patches well away from the galactic centre. Above: Incredibly densely clustered stars near the galactic core, Courtesy of the European Southern Observatory. 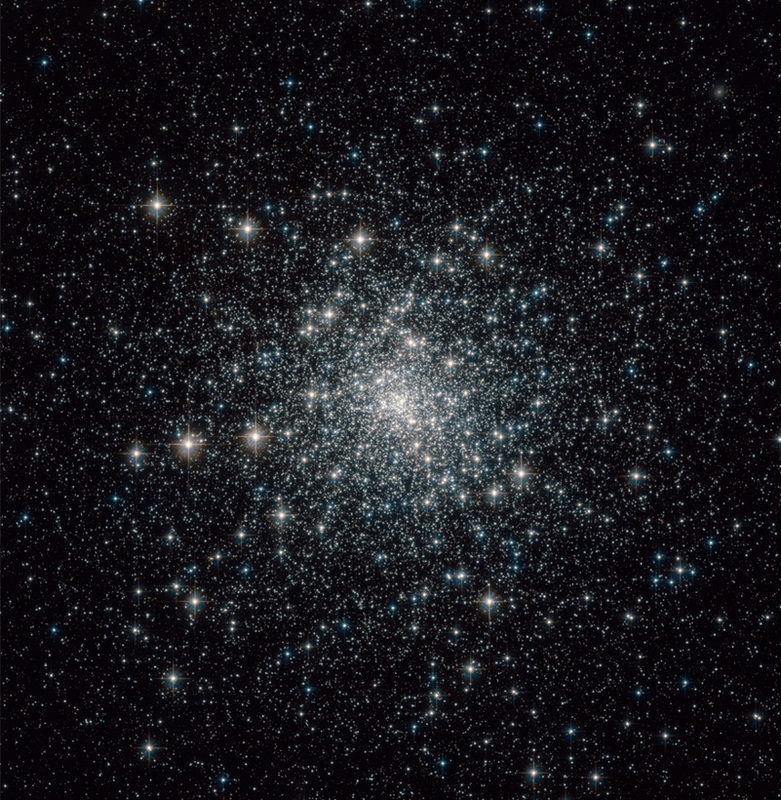 The stars of the core are densely packed, often living within fractions of a light year of each other, and many of the biggest and brightest are either huge, ancient, red stars or clusters of equally bright, young blue ones. The bright, close clustered, stars around me stop anything outside the galactic centre being visible - the core seems to be the whole universe. The sky is much, much brighter than on Earth: A lot of these stars are as bright as Venus from Earth – some are as bright as a full moon all by themselves. How bright is that in total? It’s very had to tell exactly, because clouds of gas and dust keep us from getting a really good count and the brightest stars wash out the fainter ones… but a back of the envelope calculation suggests the sky would glow with at least 1/300 the the brightness of the Sun from Earth**. If that doesn’t sound so bright – the full Moon is juist 1/400,000 the as bright as the Sun, so the sky in the galactic core would be over a thousand times brighter than the full moon. Switching the lights off on my spaceship would still leave me with the equivalent light of bright sunset. the graveyard of stars and planets that passed too close to the hole. Above: The Andromeda galaxy, in a long exposure photograph that brings out otherwise invisible details. Our galaxy might look similar, from outside. Courtesy of Brian Snyder. The galactic halo is pretty lonely place. I’m well outside the galactic bulge and the disk, which are stretched out below me. I might have expected to see something like a celestial fried egg in an infinite black frying pan - but then I’m not remembering the view from Earth: There the galaxy is a dim fuzzy band across the night sky, even though I was looking lengthwise through it, with all the accumulated light of the galaxy on my line of sight. Up here, looking down on the relatively thin galactic disk from a great distance, the only part that is very bright to the human eye is the galactic central bulge: A twinkling, fuzzy edged, blob of a billion stars – from here it’s easily brighter than the full Moon. Around it is an ethereal, almost invisible swirl of mist. That’s the galactic disk. You don’t need to take my word that it would be virtually see through: The Andromeda galaxy, that is regularly in the night sky from most locations, and it’s bigger than a full Moon. Ever seen it hanging in the sky? 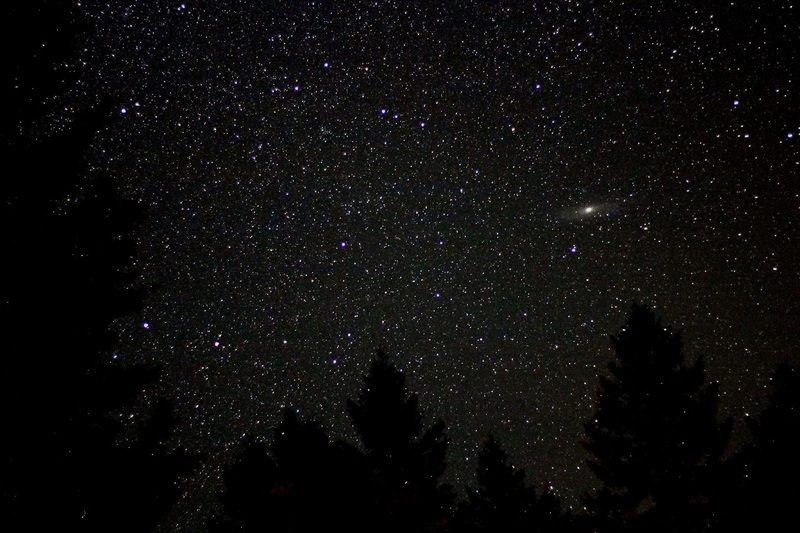 Above: The Andromeda galaxy, in a long exposure shot that makes it's outer regions brighter, and easier to see. Courtesy of Ted Van. Probably not – even through a telescope, the only really visible bit is it’s galactic core. The spiral arms are vast, but too thin for our eyes to really make out. That said, it’s a dark sky out here: Rather than being separated by five or six light years, as in the spiral arms, the stars out here are separated by hundreds or thousands of light years. For that reason, if you turn so the bright core is behind you, it’s possible to dimly make out the structure of the spiral arms. Other galaxies are also more visible than from Earth, even through the disk of the Milky Way. A globular cluster - a vast ball of ancient, close packed stars. The last stop on our galactic whistle stop tour: These are huge collections of ancient, red stars floating in the galactic halo. Mostly they're located in a shell around the galactic core - and the stars are, if anything, even more tightly packed – big, bright old stars, dating from when the rest of the galaxy was just a huge cloud of gas. I can't see much outside of the cluster, except maybe the galactic core. Although this place is as bright as the core, the quality of the light is different: Orange-white, as every star is an ancient red giant or dwarf. The close stellar quarters means that any planets will have been stripped away from their solar systems - not that there will have been many: Globular clusters are incredibly poor in heavier, planet forming, elements. This is a place where no new stars have been formed for billions of years - in many ways it's a tiny, zombie galaxy in it's own right. **The back-of-an-envelope calculation went: The very central cubic parsec (1 parsec = 3.26 lightyears) of our galaxy is estimated to contain 10,000,000 stars. To get a rough lower limit for how bright that would be, lets assume all those stars are as bright as the Sun (in reality many of them are far, far brighter), and arrange them in a sphere with a radius of 0.825 light years - the average distance from the centre assuming the stars are evenly spaced. Earth is 8 light minutes – 0.000015 of a light year, from the Sun. That means our hypothetical stars are each 55000 times further away from the centre of the sphere than the Sun is from Earth. Luminous intensity decreases with the square of distance, so each of those stars is delivering 1/ 3,025,000,000th of the Sun’s intensity at Earth. Multiplied by 10,000,000 that givs a total brightness, across the whole sky, of 1/302th the brightness of the Sun from Earth.